Cardiff Bay has been transformed. From around 1800 through to its peak around the time of the First World War, the numerous docks in the area became the largest coal exporting port in the world. Cardiff changed from being one of the smallest towns in Wales to become the largest. A cosmopolitan new population emerged in an area that became known as Tiger Bay. However, the worldwide decline in the coal market took a heavy toll and by the early 1980s the area became a derelict wasteland. In 1987 the Cardiff Bay Development Corporation was established to regenerate the area and in effect re-unite the City of Cardiff with its waterfront. 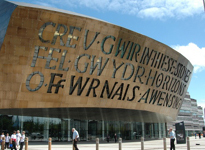 Cardiff Bay is also now home to the The National Assembly for Wales – home of the Welsh Parliament. To learn about the Assembly’s roles and responsibilities, visit “The Assembly at the Pierhead” visitor and education centre.